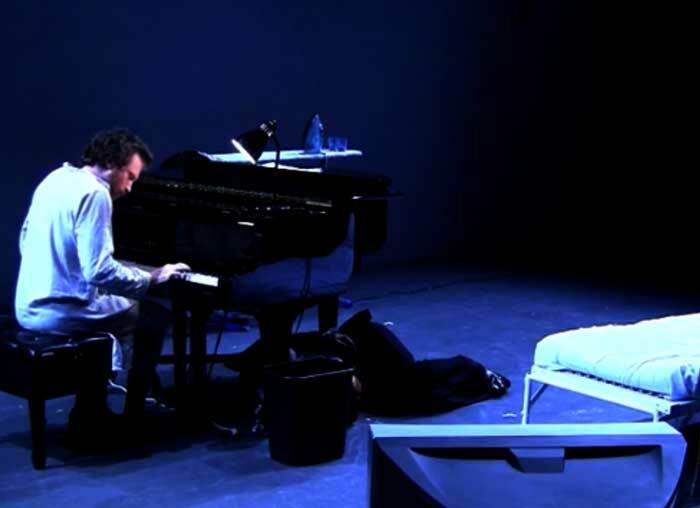 A contemporary retelling of a classic romance, Nocturne (the incomplete and inaccurate account of the love affair between George Sand & Frederic Chopin) is the love story between Fred, an ailing musician and George, a genderfluid writer. Neighbours in a New York apartment, George steals into Fred’s window one night to hear his music, and leaves with his heart. Later, when Fred is unable to satisfy George’s sexual needs, she creates a role-playing game in the hopes of seducing him, a servant that Fred is in charge of every night. But when the game starts turning sour, both Fred and George must risk seeing one another for who they really are, even if it has deadly consequences. Written by Tanya Marquardt, directed by Mallory Cattlet, performed by Jessica Jelliffe and Peter Blomquist, musical assistance by Rick Burkhardt, piano accompaniment by Alex Horwitz, dramaturgy by DD Kugler and Heidi Taylor. Original Vancouver cast was Tanya Marquardt and Paul Ternes with musical composition by Joel DeStefano. Walking Fish Festival cast was Heather Doerkson and Frano Marsic.